In 1695 the last duke of Mecklenburg-Güstrow died, and the duchy ceased to exist. Güstrow became a part of the duchy of Mecklenburg-Schwerin. Cathedral of SS. Mary, John the Evangelist and Cecilia (1226-1335, with later additions). 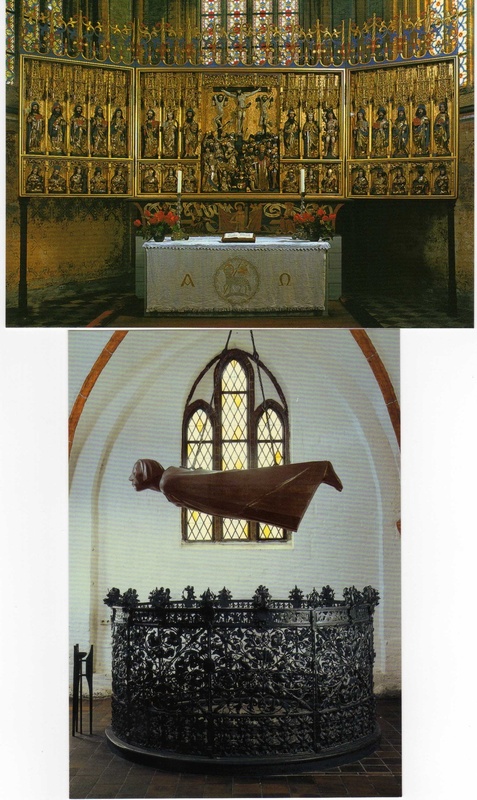 Among the most notable features in the interior are the Late Gothic high altar (see below), with panel paintings of scenes from Christ's Passion (c. 1500), the "Güstrower Domapostel" of the Lübeck master C. Berg (c. 1530), a crucifix of around 1370, the epitaph of Duke Ulrich III and his wife and the genealogy of the house of Mecklenburg (by P. Brandin, 1585-99). In the north hall is a bronze sculpture by Barlach, "The Floating Man" (originally 1926-27; melted down 1944; re-cast 1952). The Schloss (German for Castle), built in 1589 in Renaissance style, as a residence for the dukes of Mecklenburg. Between 1963 and 1981 major restoration work was carried out, and a Renaissance garden was added, modelled after descriptions appearing in old engravings. Was used to mount horses in Medieval times. What's left of the old gate. Here's the restaurant where we enjoyed some fine German treats. The Rostock quarter of Warnemunde is located 12 km north of the city centre lies directly on the coast of the Baltic Sea. Founded in about 1200, Warnemünde for centuries has been a mere fishing village with minor importance for the economic and cultural development of the region. In 1323 Warnemünde lost its autonomous status as it was purchased by the city of Rostock in order to safeguard the city?s access to the Baltic Sea. It was not until the 19th century that Warnemünde began to develop into an important sea resort. Today Warnemünde has approximately 8,400 inhabitants.